Fun fact: every week, two Empire State Building's worth of plastic floats into the oceans. The people working on a new and ambitious technology startup, The Ocean Cleanup project, are quick to point this out. They are also quick to follow up with this fact: their endeavor could clean up about 42% of the trash in the Great Pacific Garbage Patch, the world's largest conglomeration of ocean trash, within 10 years. This would mean removing at least 70,000 metric tons of plastic over that time period. That's quite the assertion, and spearheading the claim is a shaggy-haired Dutch entrepreneur, 21-year-old Boyan Slat. 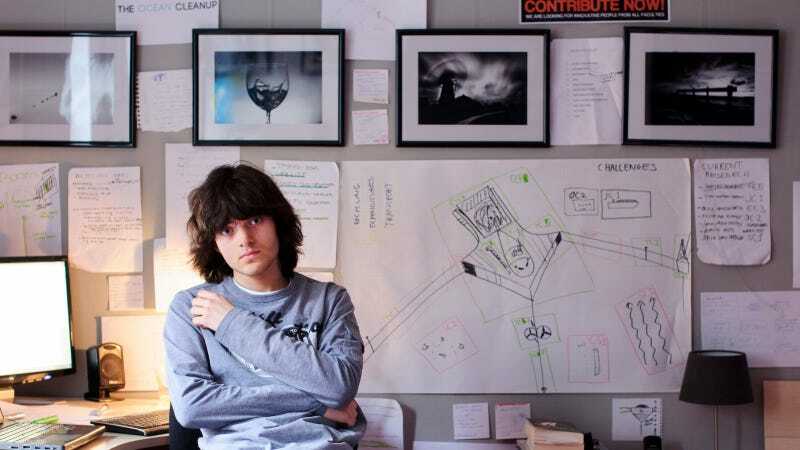 As the founder and CEO of The Ocean Cleanup, he is both the face and the engine of the project. Having started off as a crowdfunded effort that has raised $2.2 million, Slat's brainchild has come a long way—two mile-long, ocean-ready trials are planned off the Dutch and Japanese coasts in early 2016. If these prove successful, in 2020 a 60-mile, V-shaped apparatus will start concentrating ocean-strewn trash at a scale never before witnessed. If the undertaking goes as planned, it could suddenly make an intractable problem seem surmountable in a sustainable period of time. The ever-expanding mass of plastic that finds its way into the world's oceans has extremely negative environmental, economic and health impacts. According to the United Nations, plastic pollution causes at least $13 billion in damage every year to industries including fishing, shipping and tourism. More and more studies are pointing out the potential toxic results of a sea filled with plastic, with can leach chemicals into marine life that is then consumed by humans, or simply end up as environmentally unfriendly debris. All in all, about eight million tons of plastic enters the ocean every year. In 2010, between 1.5% to 4.5% of the planet's total plastic production entered the ocean, enough to cover every foot of coastline. The Ocean Cleanup project wants to use the daunting scale of the problem—and the immense force of the ocean—to their advantage. One of the company's main mottoes is "why move through the oceans, if the oceans can move through you?" Put simply, the technology uses ocean currents to concentrate trash at a central point where it can be collected and then, ideally, recycled. The designers call this "passive technology" that gathers plastic as wind and currents naturally push debris into the boons. The idea, while not necessarily a cure-all, has won a lot of support. For instance, the project was recognized as Design of the Year by the London Design Museum, which came with a more than $100,000 award. In researching the project, Slat and his team have found that most of the plastic flotsam is very close to the ocean's surface, making it reachable for cleanup. Results from a research expedition to the Pacific earlier this year found concentrations of plastic in the Pacific to be at least 10 times greater than expected, Slat told the Guardian. The longer this plastic remains in the sea, the more likely it is to disintegrate into hard-to-remove microplastics, which currently represent less than 1%, by mass, of the ocean's plastic problem, according to Slat. The most common materials in marine debris are plastics, glass, metal, paper, cloth, rubber, and wood. In an interview with actor and activist Jared Leto in October as part of Leto's "Beyond the Horizon" series, Slat said that a study this year showed that most of the species in the ocean could go extinct by 2100 due to a combination of factors including pollution, climate change and over-exploitation. "There are a lot of people who care about these issues," he said. "But they think on a way too small scale, they often focus on very local or partial solutions, and we may be worse off by doing very little instead of doing nothing." Not one for thinking small himself, Slat told Leto that if we screw up "it's not us, living creatures, it's the technology that will win." "Most of the problems we face today are side effects of things we didn't think about in the last century," he said. Slat said he first really discovered the problem of ocean trash while diving in Greece when he encountered more plastic bags than fish. "I like diving with life, and not plastic bags," he said. "I thought, heck, why not just clean this up."